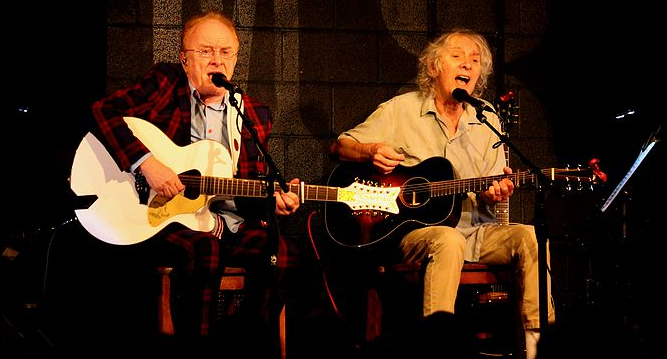 SPECIAL ACOUSTIC DUO DATES BY PETER ASHER AND ALBERT LEE. Peter Asher, CBE was born in London June 22, 1944, the son of a doctor and a professional musician. He was educated at Westminster School in London and at Kings College, London University, where he studied philosophy. Peter’s entry into the world of the performing arts was as a child actor. At the age of eight he starred in his first film, “The Planter’s Wife” as the son of Claudette Colbert and Jack Hawkins. He went on to act extensively in various film, TV, radio and stage productions. His legendary music career began in 1964 as one-half of the singing duo Peter & Gordon, who amassed nine Top 20 records during their career. Their debut single, “A World Without Love” –a song given to them by Paul McCartney – went to number one in over 30 countries, including the U.S. and U.K. In 1968, Mr. Asher became head of A&R for the Beatles newly formed record company, Apple Records, where he found, signed and produced James Taylor and worked closely with the Beatles on their individual projects. During this period he became a key figure in the “revolution” of The Sixties, founding the book shop and art gallery “Indica” (where John and Yoko met and where Allen Ginsberg and William Boroughs visited) and found himself at the centre of an era of profound social and artistic change. As a producer, Mr. Asher has worked with such diverse artists as James Taylor, 10,000 Maniacs, Diana Ross, Neil Diamond, Ringo Starr, Linda Ronstadt, Cher, Morrissey, Robin Williams, Jane Monheit, Kenny Loggins, The Dixie Chicks, Rodrigo y Gabriela, Hans Zimmer and Billy Joel, among many others. He has been awarded 37 RIAA-certified gold albums and 22 platinum albums in the U.S., and many more internationally. Mr. Asher has produced thirteen Grammy Award-winning recordings, and in 1977 and 1989 was honored individually with the Grammy Award for “Producer of the Year”. He won a further Grammy in the category of “Comedy Album of the Year” for his production work with Robin Williams. After a 37 year gap, Peter & Gordon reunited in New York for one benefit concert for a friend on August 2, 2005 which was very successful and they went on to perform together on various special occasions just for the fun of it until Gordon’s untimely death in July of 2009 . Since then Peter has continued to be in high demand as a record producer, consultant, lecturer and as a performer again in his successful one-man show, “A Musical Memoir of the 60s and Beyond”. He has also received various international awards, is a member of Mensa and of SAG-AFTRA, a National Trustee of the Recording Academy and has been a frequent keynote speaker at industry events. With Hans Zimmer, Peter produced music for “Pirates of the Caribbean 4”, “Sherlock Holmes 2”, “Madagascar 3”, “Man of Steel” and “Rush”.In fact, Peter sang and produced the only original song in “Madagascar 3”, the love theme “Love Always Comes as a Surprise” which Peter co-wrote with his friend Dave Stewart. He also collaborated with Zimmer and Pharrell Williams on the production of all the musical elements of the Academy Awards show 2012 and recently completed a production project with Elton John, with current artists singing the songs from “Yellow Brick Road” on the occasion of the 40th anniversary of that album. The artists include Ed Sheeran, Miguel, The Band Perry, John Grant, Fall Out Boy and Hunter Hayes and the album was released in March 2014. Albert Lee’s impeccable country music and rock pedigree stretches back over more than 40 years. He has performed with many of the greats in country and rock, including Joe Cocker, Emmylou Harris, Eric Clapton and the Everly Brothers. As well as being a top guitarist, he is also a red hot piano player and a pretty good singer too.